Kamole Sands has acres of luxurious tropical gardens and private spots for picnics by the fountain pond. Swim in the large swimming pool or relax in one of the two jet spas. There is also a children's wading pool. Stroll along golden sand beaches and enjoy an ocean full of water sports including snorkeling. Shopping and restaurants are just minutes walking distance away. 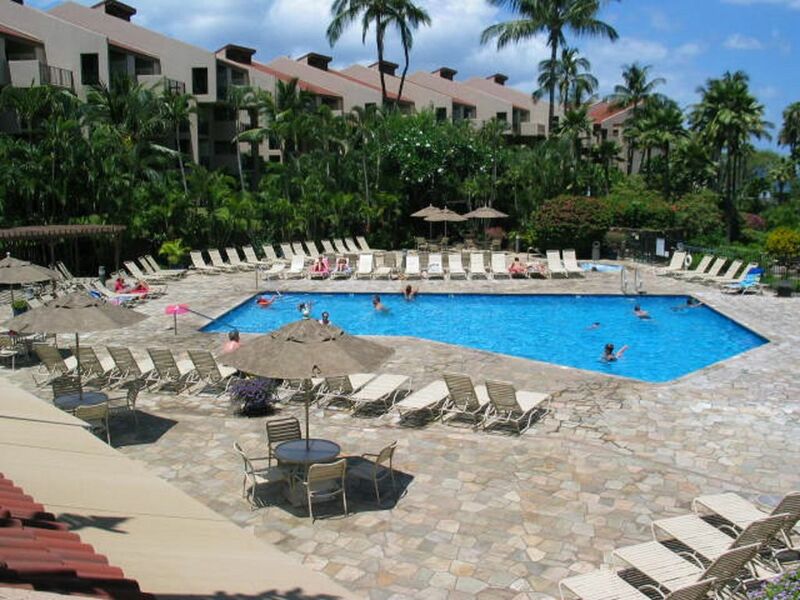 Kamaole Sands also offers four free tennis courts, gas BBQ grills, and an Activity Center. Free parking. Our 1035 square foot two bedroom condo located on the 3rd floor of Building 5 features two bedrooms on the same level (king bed in master bedroom, two twin beds in 2nd bedroom plus a queen sized sofa hidabed in the living room), two full baths, a complete kitchen, and a private lanai overlooking the pool. Complete kitchen includes electric stove, refrigerator, microwave, dishwasher, coffee maker, toaster, blender, etc. Unit is fully equipped with chinaware, glassware, silverware, pots, pans, cutlery, etc. Our condo is decorated with mirrors, plants and lovely paintings by local artists. It has a HDTV in the living room plus a TV in the master bedroom, A/C, ceiling fans, DVD, and a stereo. All towels and linens are provided including beach towels. There is also a hair dryer. Complete laundry facilities are in the unit along with an iron and ironing board. Laundry soap is provided. We also have a 1BR, 2 bath POV Condo at Kamaole Sands on the 3rd floor in Bldg. 2. This unit has a spacious 166 sq.ft. private lanai which overlooks the fountain pond to the ocean. There is a king bed in the bedroom plus a sofa hide-a-bed in the living room. Rates from $129. For more information on this unit, see my VRBO ad #191718. In addition to our condos at Kamaole Sands Resort, we also own three 1 BR oceanview condos and a 2BR ocenfront condo at the Maui Sunset Resort. For more information on these units, see vrbo #185950 for our 1 BR units and vrbo #223057 for our 2 BR unit. Resort Fee - the resort requires that all guests register at the office upon arrival. At that time you will receive a resort map, the combination for the pool and the side gates plus a parking slip for your reserved parking space #341. The Kamaole Sands office will charge you a resort fee of $35 (plus tax). 37 inch HDTV in living room plus 2nd TV in master bedroom. Large pool plus a childlren's wading pool. Kamaole Sands a very nice complex. The kitchen and baths of condo updated and in good order. But remainder of condo in need of upgrades. Beds not comfortable. Would not stay here again. The beds are pillow top style so not firm or hard. We have many repeat guests who love the comfort of the beds. This is the first complaint we have had about the comfort. I am sorry you were disappointed. Thanks. I'm so glad you had a wonderful vacation. Would definitley stay here again! There were lots of dishes, cooking supplies and utensils. We didn't run out of dishes at one meal. Everything worked which was nice. Even though there was air conditioning, we didn't use it much. With the windows open and fans on, the trade winds kept the condo comfortable. Although when we did use it, it worked and cooled the condo down nicely. Loved having the 2brms and 2 baths. My only suggestion for the second bedroom would be to install light blocking drapes. The morning light brightens that room early and the kids couldn't sleep in as much because it was too bright. Otherwise, the beds were comfy. Loved having all the extra pillows. Loved all the extra towels, especially the beach towels. There were lots of beach mats and the boogy boards were wonderful to use. Loved the fact that the condo grounds and rules are enforced. No horse play in the pool and quiet time is enforced. We appreciated that. This building is the farthest from the beach but nice and close to the pool. It's nice and quiet and you don't get noise from the street as you would with the buildings closest to the beach. We liked that. We didn't eat out much at the local restaurants. We saved money by cooking at the condo. The bbq grills were fantastic. The maintenace crew cleaned the newer bbqs daily. When we went to use them almost each night, it was like bbqing on a new and cleaned grill. Any questions we did have were answered by you and your maintenace staff promptly. Thanks for buying another fan for us. Thanks for a great place to call home during our stay on Maui. Hoping to come back again and would stay here. Rates do not include 13.416% Hawaii GE/Lodging taxes (HI Tax ID: TA-187-452-8256-01 & GE-187-452-8256-01) Kamaole Sands Office charges a $35.00 plus tax Resort Fee at time of registration. Additional $99 cleaning fee for stays less than 7 nights.